Monday night in New Orleans was all about Drew Brees’ record setting statement as he broke Peyton Manning’s NFL record for all-time passing yards. Following the dismantling of the Washington Redskins on the field, running back Alvin Kamara had his own powerful message in the locker room. 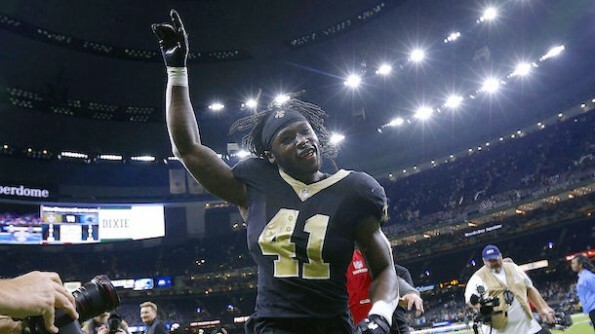 In a season where sideline protests have reached a huge decline during the National Anthem, Kamara is one of the most powerful statements since Colin Kaepernick first explained why he was taking a knee during the Star-Spangled Banner. Kamara’s gesture comes just one day after Eric Reid made his official return to a football field with the Carolina Panthers and took a knee during the Anthem. The hat wasn’t all for show either, Kamara has spoken about this before during an issue he had with American Airlines back in May.